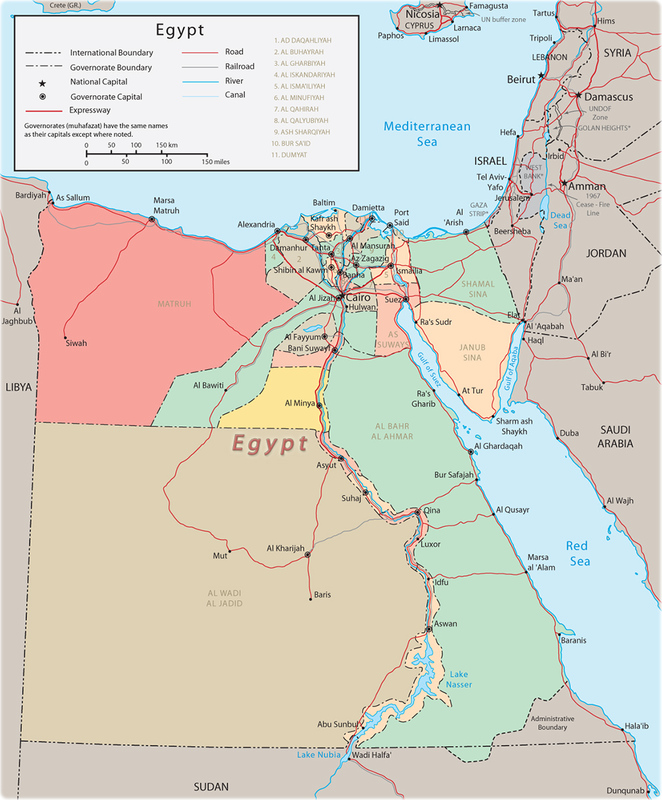 Egypt is bounded on the north by the Mediterranean Sea, on the east by the Gaza Strip, Israel, and the Red Sea, on the south by Sudan, and on the west by Libya. Less than one-tenth of the land area of Egypt is settled or under cultivation. This territory consists of the valley and delta of the Nile, a number of desert oases, and land along the Suez Canal, which connects the Mediterranean with the Gulf of Suez, an arm of the Red Sea. More than 90 percent of the country consists of desert areas, including the Libyan Desert in the west, a part of the Sahara, and the Arabian Desert, which borders the Red Sea and the Gulf of Suez, in the east. Suez Canal, Egypt 1992. 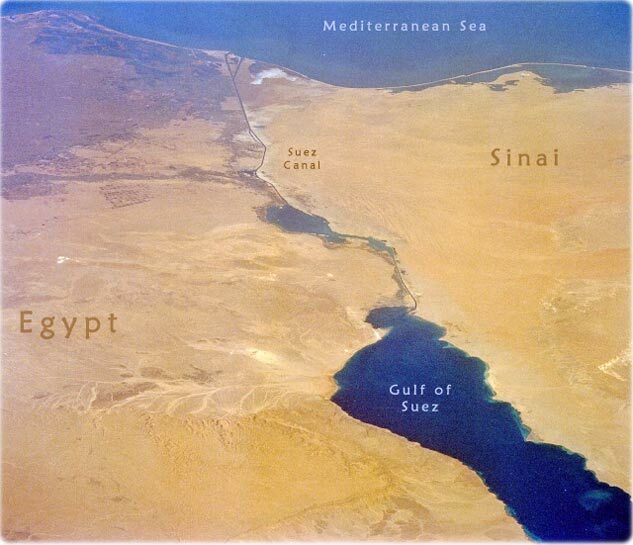 The entire length of Egypt’s Suez Canal (dark north-south line) is visible in this low-oblique, northeast-looking photograph. Extending from the port city of Suez in the south to Port Said in the north, a distance of approximately 160 km, the canal connects the Red Sea with the eastern Mediterranean Sea. The minimum width of the canal is 55 m, and the minimum depth of the channel is 12 m. Ships entering the canal from the south pass through the Gulf of Suez, Little Bitter Lake, Great Bitter Lake, and into the main body of the canal. The sandy desert of the northwest Sinai Peninsula occupies the territory east of the canal, and the large dark area west of the canal is the eastern extent of the Nile River Delta. The dendrite drainage feature along the northwest side of the Gulf of Suez is Khafuri Wadi. The narrow swath of green extending east-west on the west side of the canal is a strip of irrigated farmland that borders the Ismailia Canal, which connects Cairo with the Suez Canal at the city of Ismailia. Many center-pivot irrigation field patterns are visible in a roughly rectangular area south of the Ismailia Canal (NASA). Copyright © Geographic Guide - maps of the Continent.